The United Arab Emirates is a thriving country and a valuable potential market for your business. Buy this UAE mailing list to get ahead of the competition and put your pitch directly in the hands of those mostly likely to become your customers. Tapping into foreign markets isn't always easy, especially when you don't know how to find the right people to talk to, those who have the most potential to buy what your business is selling. You can waste a lot of time trying to compile your own email marketing list … or you can cut right to the chase and buy this United Arab Emirates email list, which contains the important contact information you need for sales leads in Abu Dhabi, Dubai, Ajman, Sharjah, Fujairah, Ras al-Khaimah, and Umm al-Quwain. When you buy a business database from us, you won't just get generic contacts that lead nowhere, like [email protected] or mailing addresses that start with "Manager." 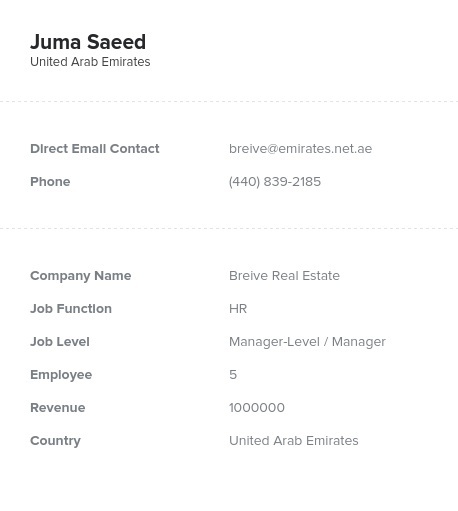 This United Arab Emirates email database contains direct, human-verified contact details including real names, job titles, information about their companies, mailing addresses, email addresses, phone numbers, and fax numbers. Best of all, every B2B email list we sell is regularly checked by machines and by real people to make sure that it's accurate. Let us take the hassle out of compiling business contact lists. Just buy this mailing list of UAE sales leads, download the .CSV file, and in minutes, your sales staff can be forging new connections with potential clients.